Concord, NC (February 6, 2019) – A familiar face and increasingly popular figure on tour for the last few years, Christian Eckes finally gets his shot to compete for an ARCA Racing Series presented by Menards Championship starting with Saturday’s season opening event at Daytona International Speedway. 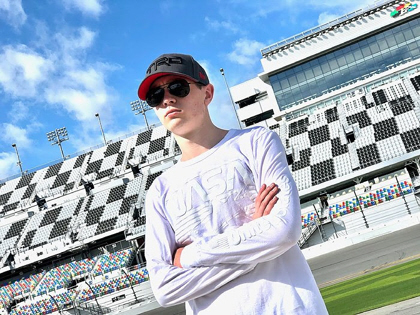 Eckes, 18, a three-time series winner, will pilot Venturini Motorsports’ (VMS) No.15 JBL Audio Toyota with crew chief Kevin Reed at the controls. A native of Middletown, NY and a member of the Toyota Racing Development’s (TRD) family, Eckes is ready to get his 2019 campaign underway. “I’ve never been more excited and more ready to start a season,” says Eckes. “There’s a lot of preparation that goes into offseason training. No matter if you’re running for a championship or not, the sacrifice you put in during the off-season will pay dividends once the season starts. I pride myself on my preparation and my will to succeed – I can assure you there was no shortage of that this year. I’ve kept extremely busy training, logging simulation seat time and straight pen/ paper. I feel as though I’m as ready as ever. “Obviously our goal going into this season is the championship. But to get there we need to be smart and take it one step at a time, one track at a time. Every race is different. My only focus is doing the best of my ability each and every week I hit the track. Since signing with VMS in 2016, Eckes has made 27 career ARCA starts over the last three seasons. Achieving notable success, the former Snowball Derby winner had a breakout season in ’18, earning his first career ARCA win at Salem Speedway in April before going on to notch two more victories at Springfield’s dirt mile and at Lucas Oil Raceway. Earning two General Tire Pole Awards along the way, Eckes led 421-laps in just 13 starts last season.